You can also watch it on your computer and use your mouse to change your view. Prefer people watching to thrill seeking? Put yourself in the middle of the main hall in Grand Central Terminal in New York and take in everything around you through Facebook’s short film Here and Now. Shot with the company’s Surround 360 3-D 360-degree camera system, the movie lets you experience the sights and sounds exactly as if you were there. These are just two examples of 360° video, one of the newest advances in the medium. And while they were created more for entertainment, it’s not hard to see the many, MANY applications the technology can — and will — have in marketing. Do your prospective diners want to experience the ambiance of your restaurant before they make a reservation? No problem. Are brides eager to look around your venue as they consider it for their wedding reception? Done. Want to show people how your sports car/boat/skateboard performs in the real world? You can do that. Soon these types of virtual experiences will be as common as the helpful, but much more limiting, video tours that are prevalent today. 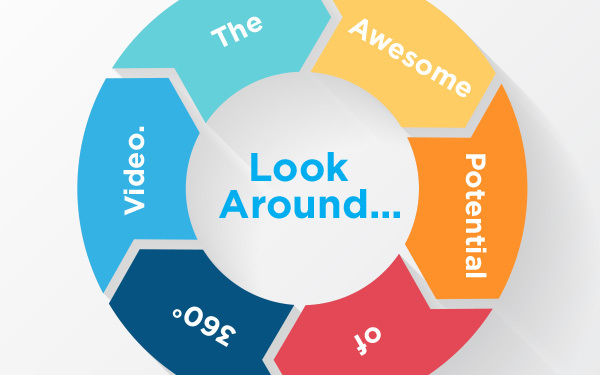 As you prepare to undertake this type of project, which is also frequently referred to as “spherical video,” there are some points to keep in mind. Cost. As you’d expect, spherical video isn’t cheap to produce. With improvements in the technology and more providers bringing products to market, the price will fall. You just need to decide when you’re ready to jump in. New techniques. Crafting a 360° video requires a different approach to storytelling and filmmaking. You have to be open to thinking of the end product as an immersive experience and not a traditional linear video. Effective strategy. By all accounts, people love the spherical video experience and will eagerly consume yours. But in order to make it work as a part of your overall marketing plan, you and your provider will need to give serious consideration to how, when, where, and why to use it. Spherical video is poised for tremendous growth in the months ahead. And with the average consumer’s appetite for “immersion” — and the resulting increase in awareness and revenue for you if you satisfy it — the technology will not simply be a trend. 360° video is not a flash in the pan. It’s here to stay. And companies that become familiar with, and fluent in, this type of storytelling will have a distinct competitive advantage.